What is the Agile Frameworks Night all about? The PMO is continuing to evolve. As organizations wrestle with digital business of the supply chain and an increasing appetite for innovation and disruption, many Project Management Offices are exploring adaptive execution approaches that allow them to deliver rapidly and iteratively. No longer are PMOs focused solely on the development of Project, Program and Portfolio managers, but they are developing product managers and embracing product lifecycles. Focusing on initiatives with a clear Start-Middle-End, modern PMOs are focused on continuous delivery and continuous transformation. As companies embrace Agile frameworks like Scrum, DSDM, XP and lean approaches such as Kanban they often experience difficulties with scaling. This is not surprising given that Agile has its roots in small, co-located teams. Shifting from an organization with a few agile teams to one being an organization that embraces agility at all levels is challenging, but there are some frameworks that PMOs can learn from and adapt to their own environments. There are a range of frameworks for scaling agile, such as the Scaled Agile Framework (SAFe), Large Scale Scrum (LeSS), and Disciplined Agile Delivery (DAD). There are also a number of techniques that help with scaling challenges such as Scrum of Scrums (sometimes called MetaScrums). Whilst each framework approaches things differently, they all come with processes that build flexibility into the organization and they all stem from the principles outlines in the Agile Manifesto. Some offer a very rigid and prescriptive framework, whereas others are more adaptable and put the emphasis on guidelines rather than mandatory process. 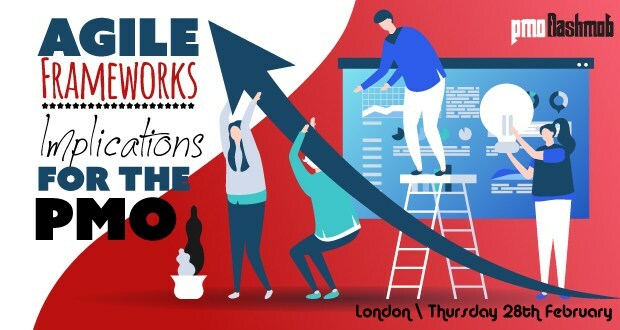 In this PMO Flashmob masterclass Jon Ward will guide PMO Professionals through the available scaling frameworks. He’ll explain what they are about and what the key differences between each framework are. He will also explore what scaled agile means for the PMO - the team who invariably have to strike the delicate balance between rapid execution and governance. The PMOFlashmob event is being held in London’s iconic Walkie-Talkie building. As is standard for a PMO Flashmob event, there will be food and drink provided and a contingent will move to a local bar for drinks after the PMO Meetup. The PMO Flashmob Scaled Agile event promises to be highly interactive and aims to give you tools that you can use the moment you get back to your office.